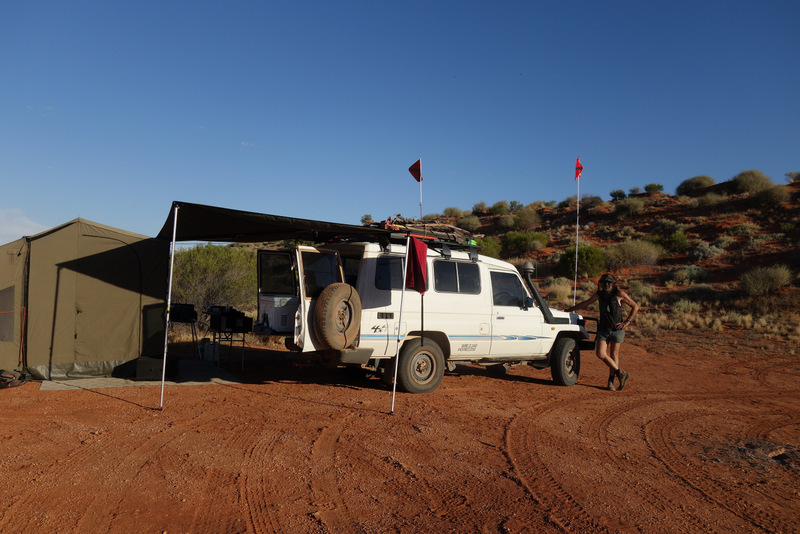 The first trip of our grey nomad life covering about 7500 km over 3 weeks on mostly unsealed roads to Alice Springs and beyond with the highlight being the crossing of the Simpson Desert. This was the first longish term trip for the new fitout of the troopy, apart from the drives down to Melbourne. Day 1 to Gilbert River near Croyden. 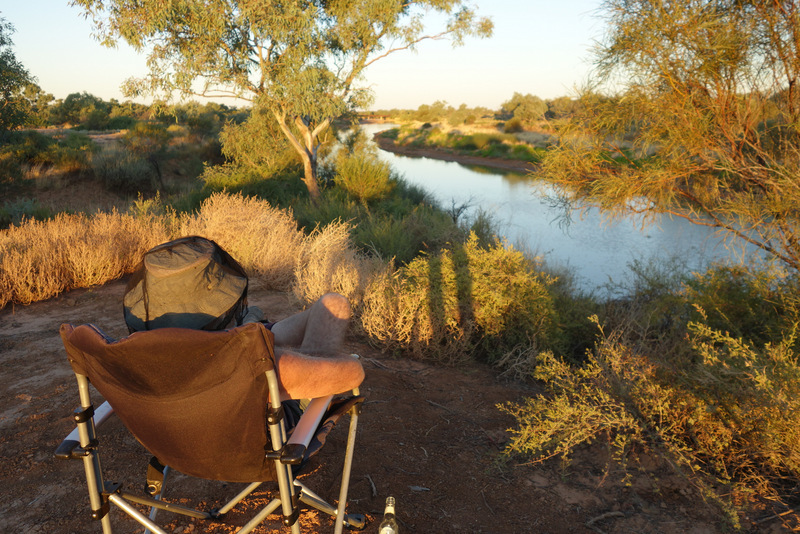 Excellent camp on the river bank about 3 km south of the main road just after the river crossing. Guinea fowl feathers and chattering, but didn’t see the birds. 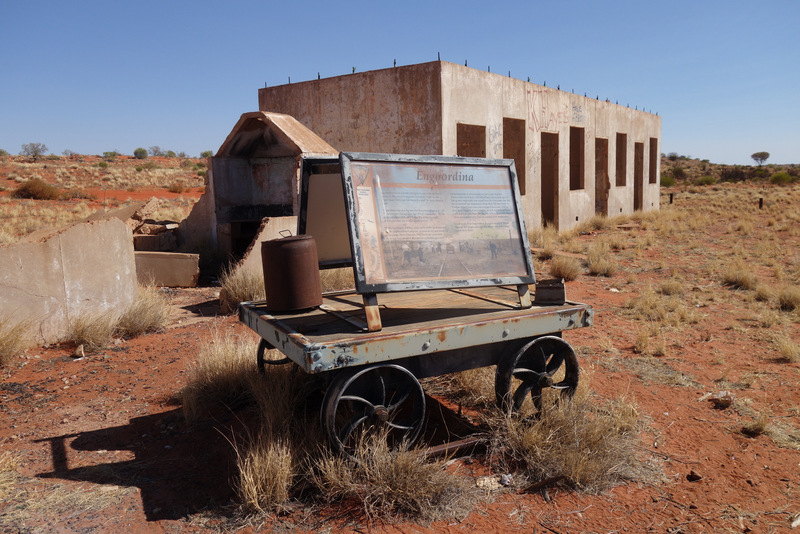 Croyden is a town undergoing a redevelopment based around its early history of mining. 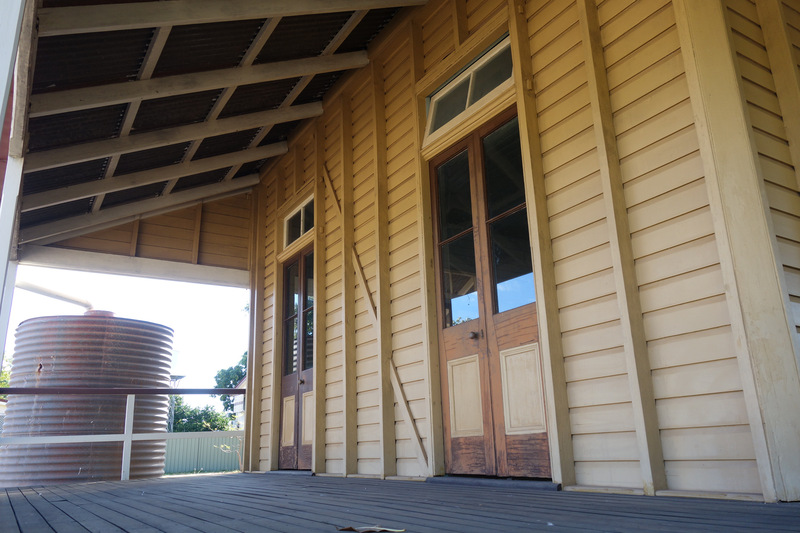 Many buildings are in good conditions and have been renovated and left on open display with information boards and a visitor centre. Most interesting place to spend a few hours. 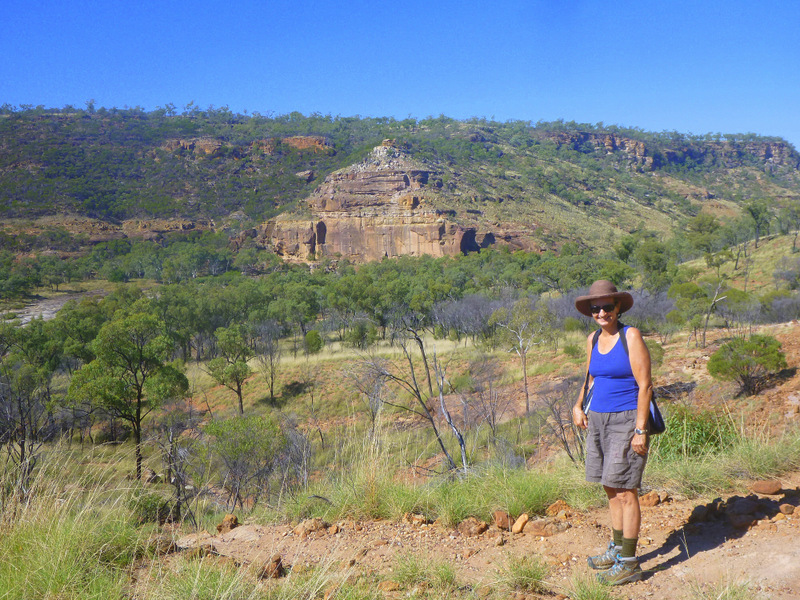 Day 2 to Corella Dam near Cloncurry. Refueled at the Burke and Wills Roadhouse before going south to Cloncurry. 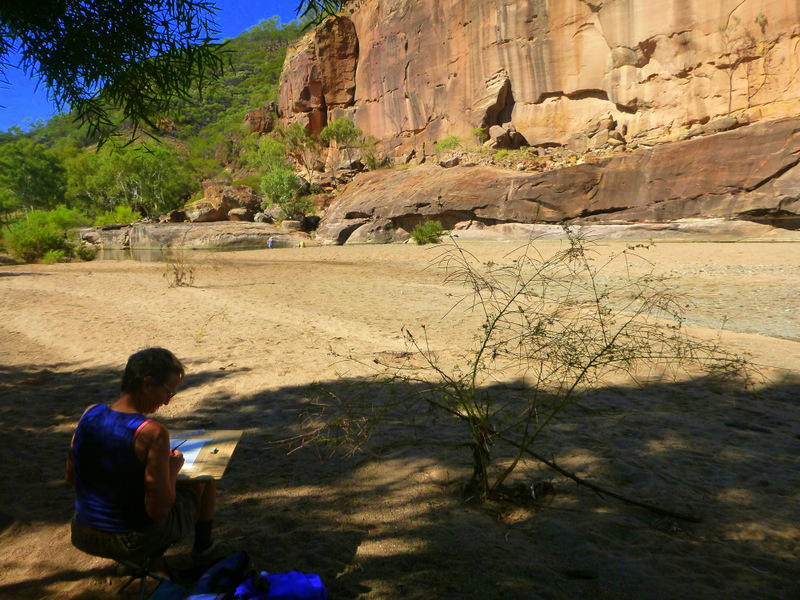 Had a look at a few places, but they were too close to the main road and so we finished up at the Corella Dam. Many longer term campers on the dam bank with fishing boats etc. Lots of space for many more away from the water. Quiet enough. 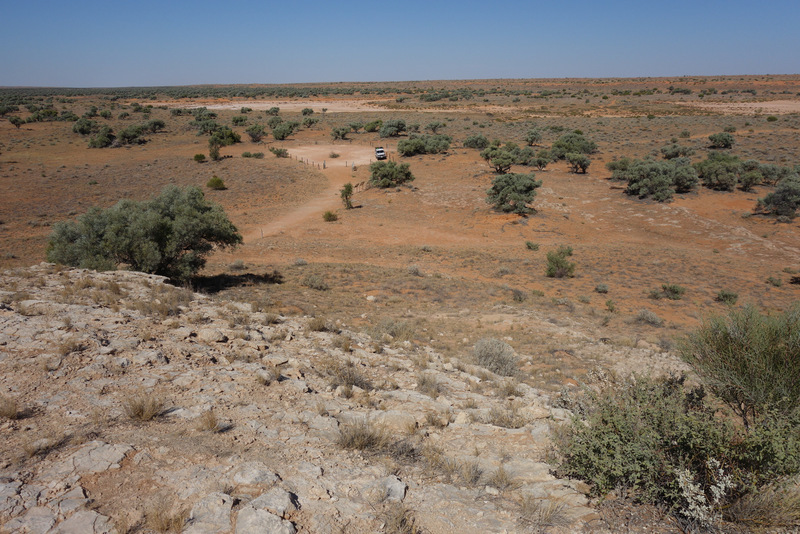 Day 3 to Between the Hills camp on Plenty Hwy, 300km from Alice. 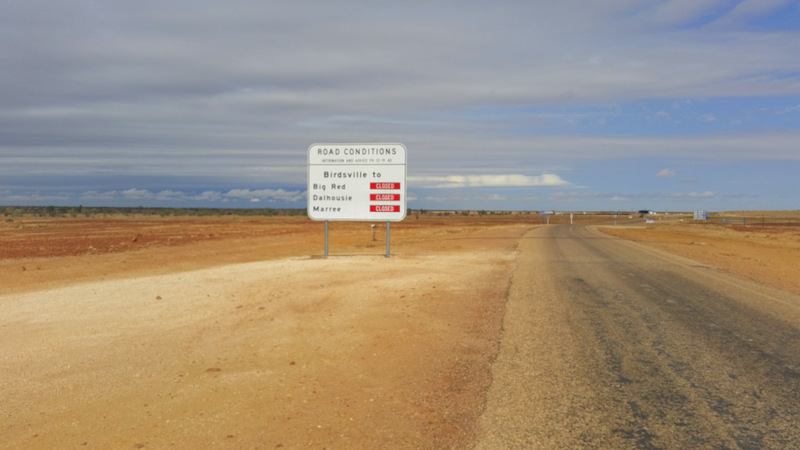 Across to Mt Isa, then south to Urandangi and gravel roads for most of the next 6000 kms. 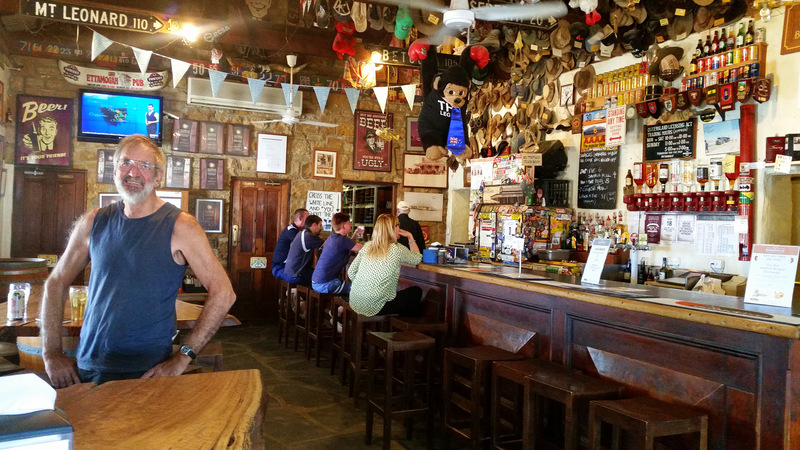 Urandangie pub for fuel and a visit with the friendly publican and donkey. Open Sky country. 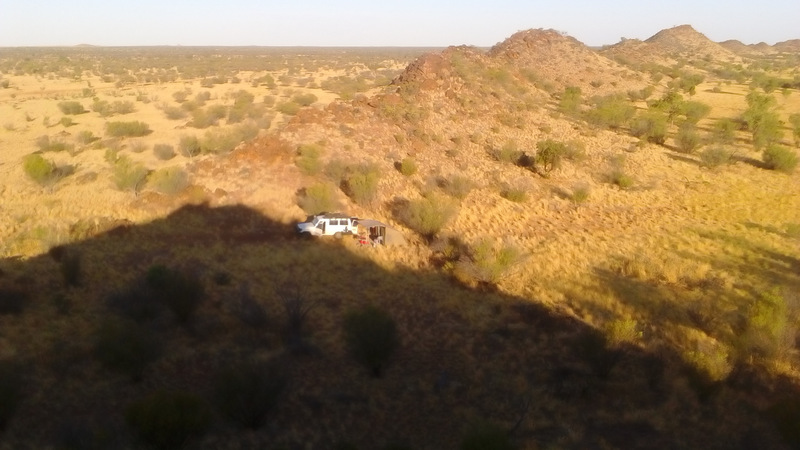 Campsite on a saddle about 1 km off the Plenty Hwy. Camp “between the hills” on the Plenty hwy. 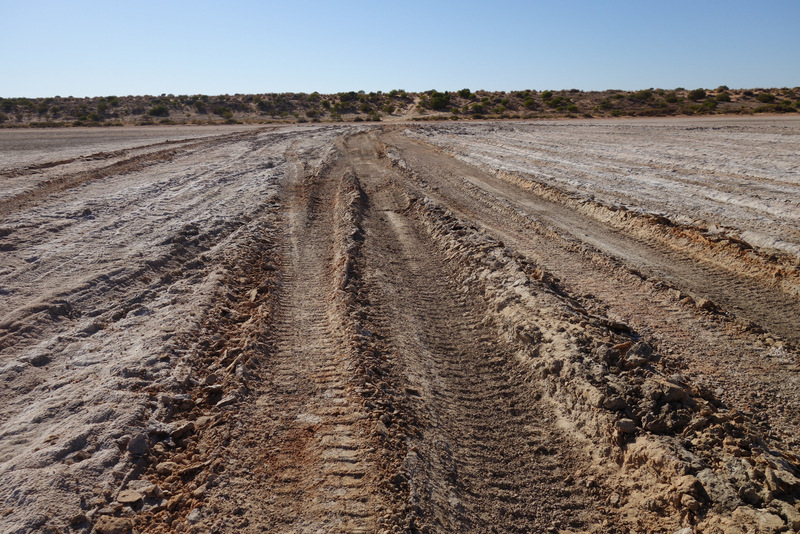 Faint wheel tracks, almost cross country up to the saddle are the probable cause of a blown tyre the next morning. Good gravel road, travelling 80-90 kph, but some corrugations, so the flat tyre wasn’t felt until far too late, when I saw the tube get spat out in the rear view. Day 4 and 5 Heritage Caravan Park, Alice Springs. Recovery day in Alice after fitting second spare with tube and insert. Noisy dogs in cp when owners off to work. 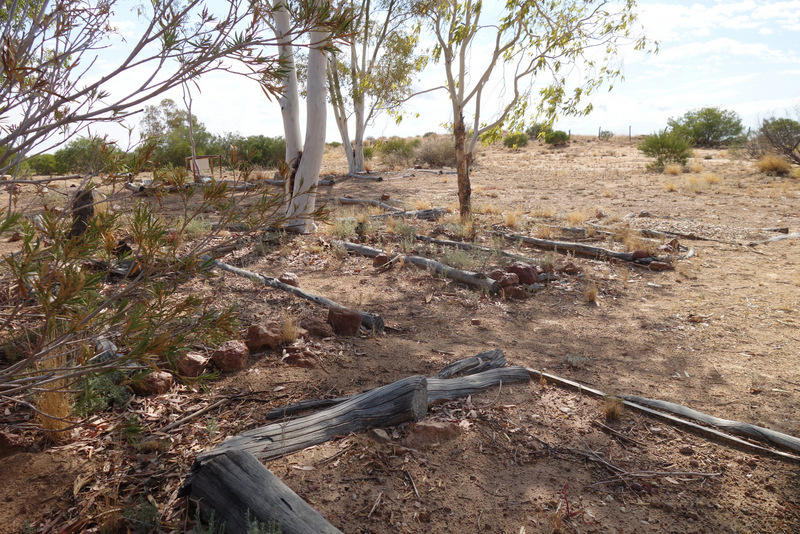 Reminiscing on the start of the Larapinta Track at the Old Telegraph Station. Day 6 to Chambers Pillar. Looks as if Alison was here earlier. Workers had taken half the camp building people proof footpaths up to the viewpoint. Parks walkways are a necessary evil, but far worse than the graffiti. 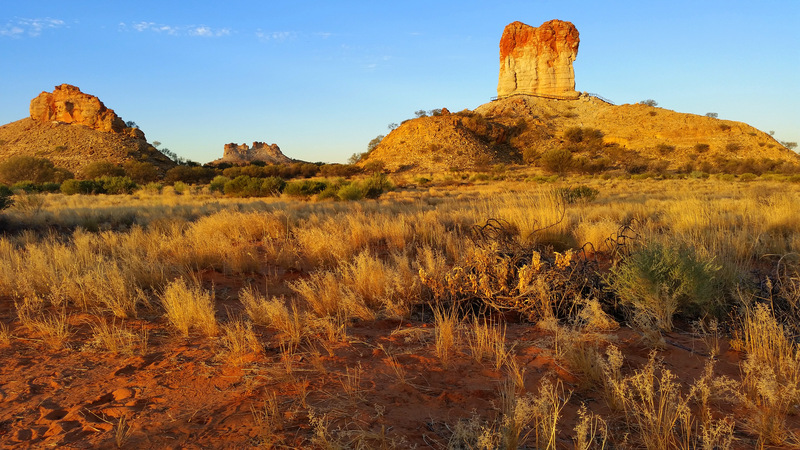 We walk out to a seat on the western side to watch the colour change on the rocks with sunset. We’re a couple of days past the full moon, but it also looks good from the eastern side. Day 7 to Old Andodo Station. Railway siding by the road. Road now where the railway used to be, hundreds of railway spikes floating in the road gravel make you worry for tyres. The old road now a race track for an annual event. Deep sand and moguls for 100 kms. 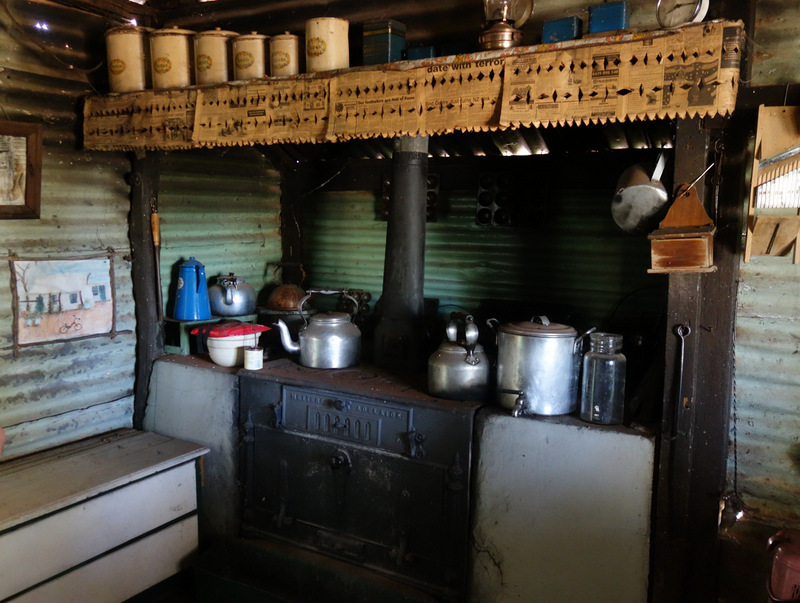 We head out to Old Andodo station, which was lived in by Mollie until 2012, and is now regarded as a living museum. It is as if Mollie has just left. Day 8 to Dalhousie Springs. An expensive visit to Mt Dare road house for a top up of fuel for $2.20 a litre, a parks pass for $160, and a compulsory sand flag for $130. 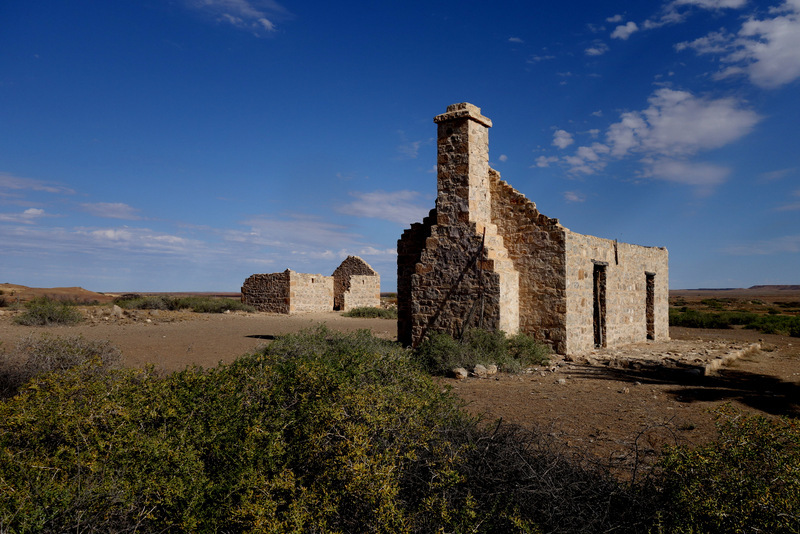 We go down to the ruin remaining of the Dalhousie Springs Station, which was very active before the desert climate reestablished itself. Then on for a hot bath in the lake at Dalhousie Springs. Another dozen campers overnight, but lots more room, so this does get crowded later in the season. 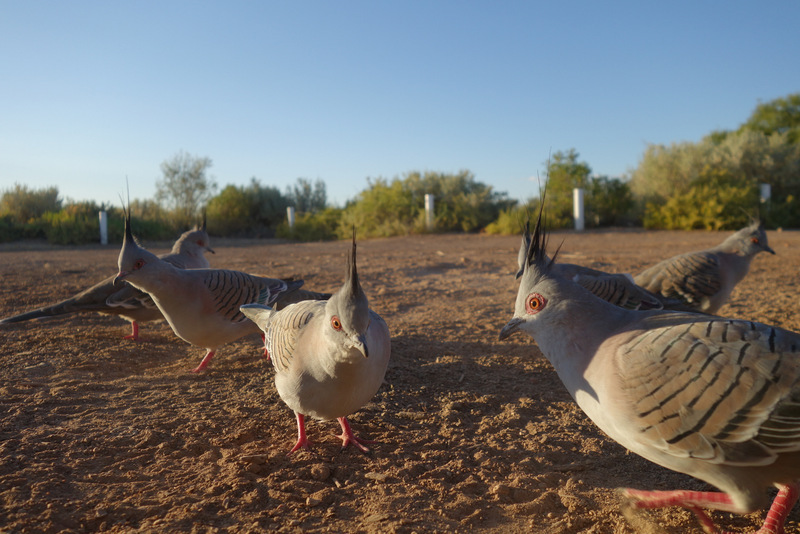 Crested pigeons are the clean up crew. 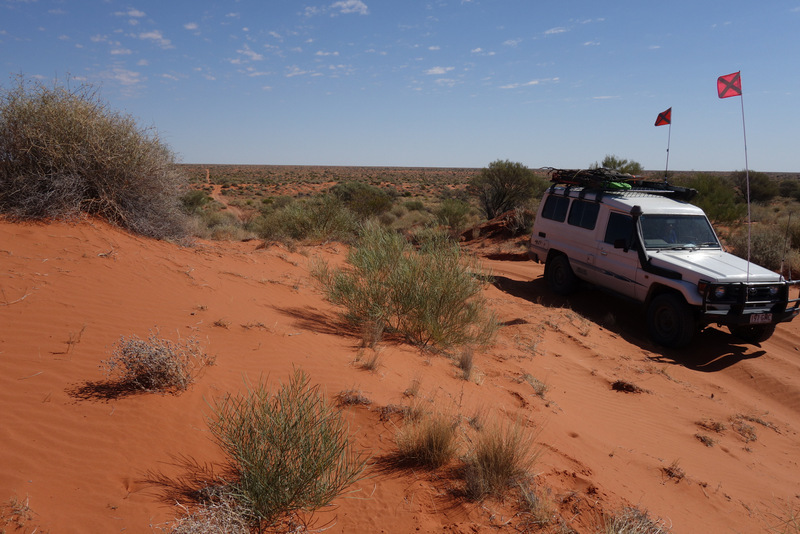 Day 9 to Mokari airstrip, Simpson Desert. Purnie Bore doesn’t look drinkable, but it is hot. Out past Purnie Bore and the dunes start to get serious. Tyres down to 25 psi and radioing from some crests to check for west bound traffic. “This is snow white troopy eastbound on the French Line at 153 km post. Any west bound traffic read me?” We turned south off the French Line to follow the Rig road and camped where it also turns to the east. 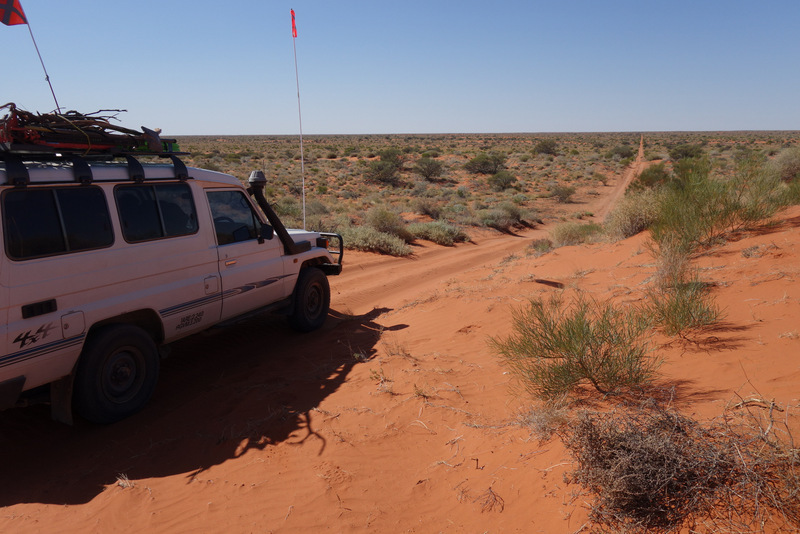 Day 10 to near Lone Gum, Rig Road in Simpson Desert. 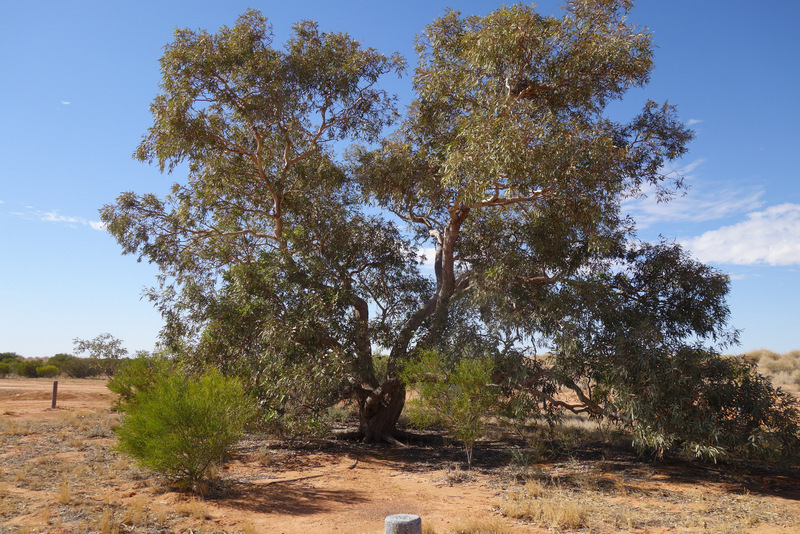 The lone gum, a coolibah hundreds of kms from the nearest trees. Usually only found on creekbanks. East along the Rig rd to the Colson Track, then north back to the French Line to head east to the Erabena Track to follow it back south to the Rig Rd again. French Line is very chewed up, with large hummocks limiting speed to around 20 kph, making momentum unusable to get over the dunes. Which is how they formed in the first place. 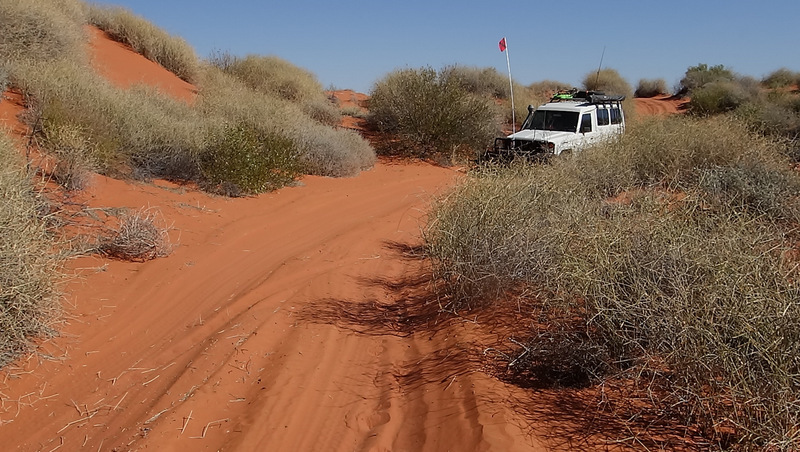 The north south tracks along the swales are easy 2 wd, while we go into 4wd for the dunes and sometimes into low range for the crests. Camp by the side of the track, with the shower hanging from a tree. 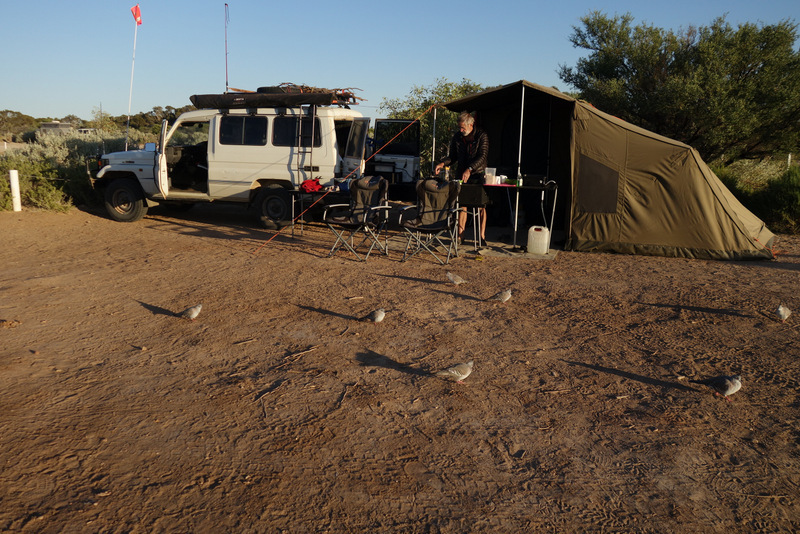 Day 11 camp on QAA line near Qld border, Simpson Desert. 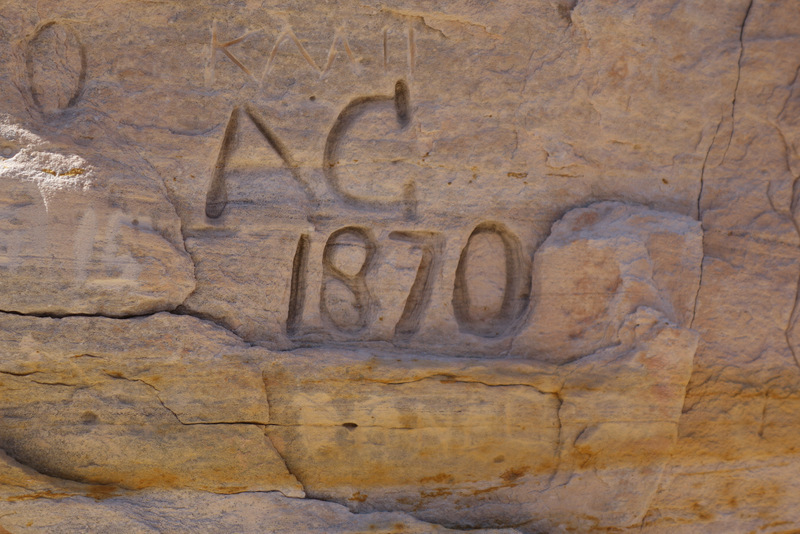 Approdina attori knoll, the only rock outcrop in the desert. 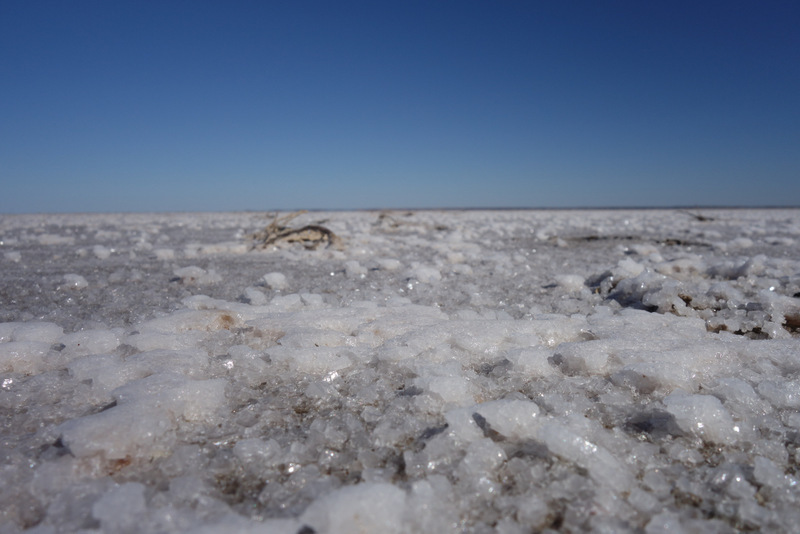 Even then it is made up of windblown carbonates off the salt lakes. 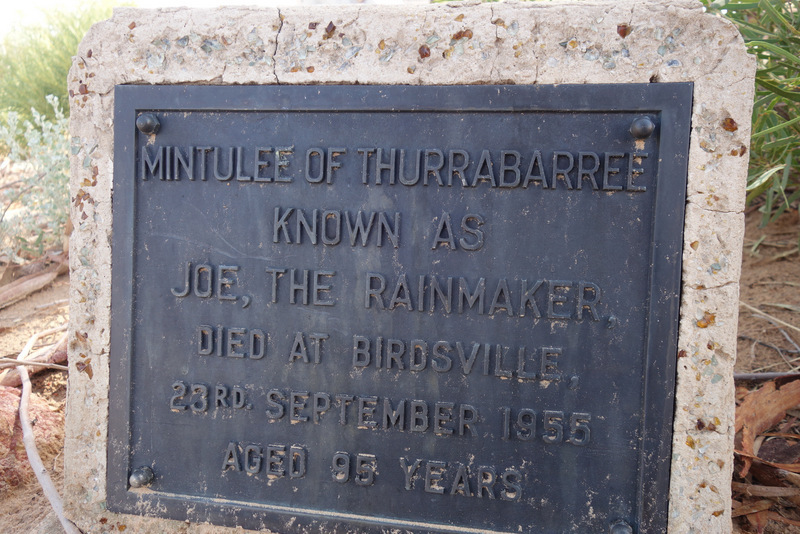 Day 12 and 13 Birdsville. Dunes seem to be fewer but larger and the sand much dryer. 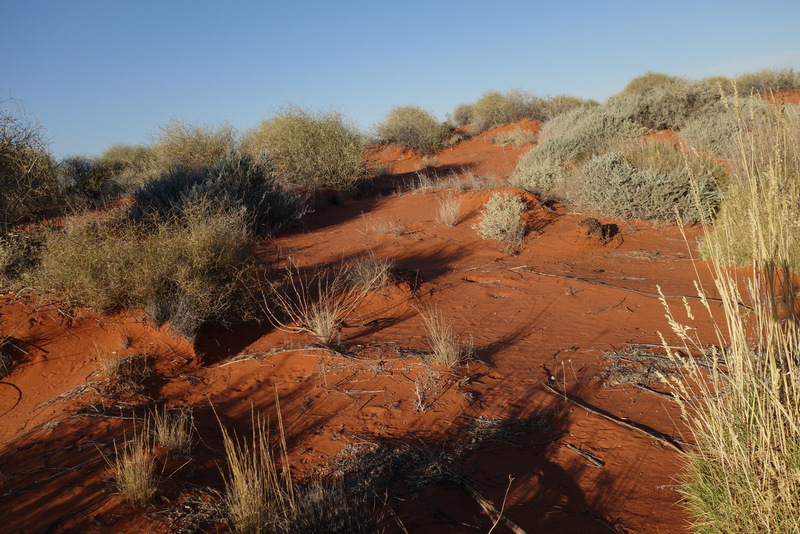 The last dune of all is the largest, at around 40 m of steep and loose sand. Deeply hummocked, so down into low range and crawl up to be defeated by the last 2 m of drifting sand. 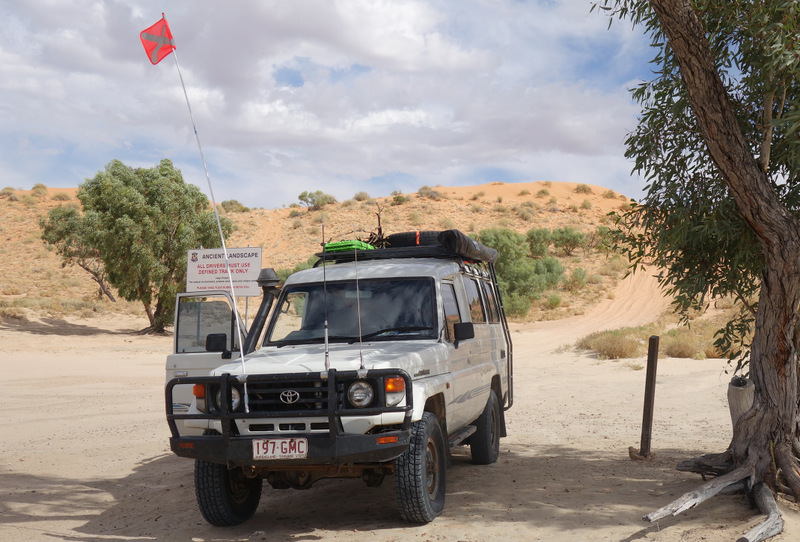 There is a hard plateau running across the dune just below this crest, so we are able to back up and have a few more goes before finally letting the tyres down again to 18 psi and powering over. Down the steeper eastern side to find another car on his way up, who then backed all the way down again to let us by. He must have been getting a bit impatient as we had spoken to him on the radio, and he knew we were on our way. 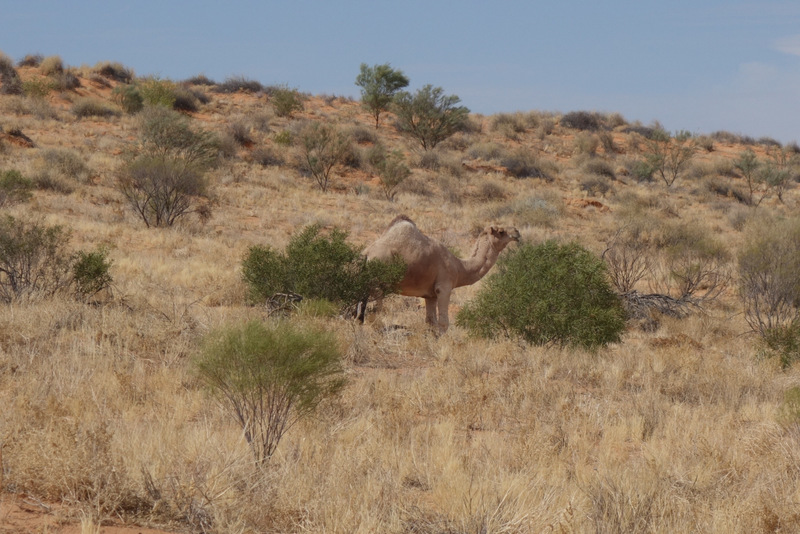 Lots of dingos, some camels and emu along the way. 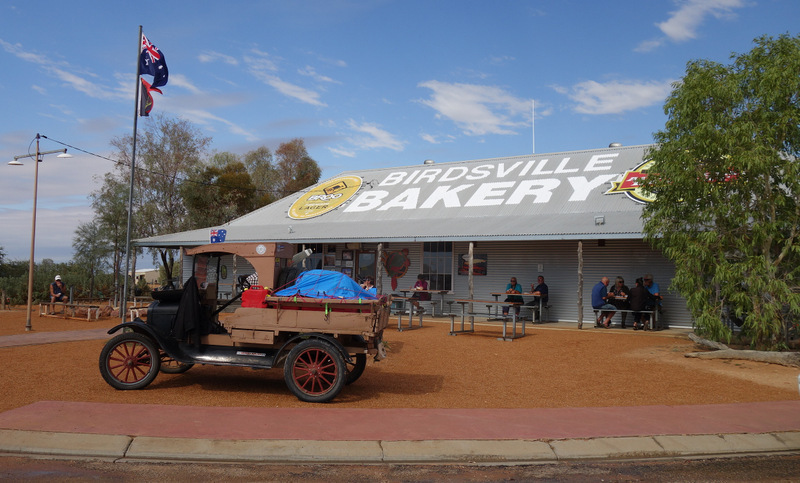 Birdsville is a lovely little town in winter, the caravan park has only a few dozen camps and we are able to camp near the water filled billabong. The pub and bakery are doing a roaring trade. We eat at the bakery, which has a fire out front. 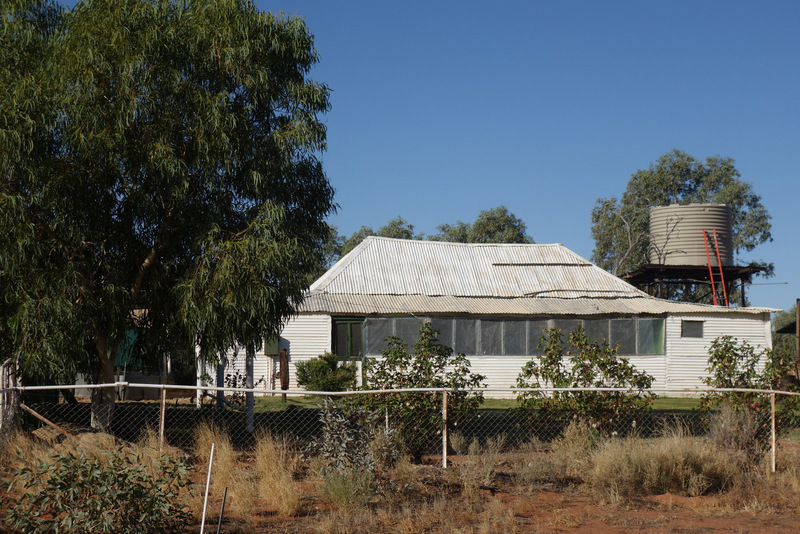 Birdsville icon, the pub not the man. The old ford drives around town entertaining petrol heads. It rains overnight, 13 mm, and the camp ground around our tent is reduced to a sea of black sticky mud. All roads in and out are closed so we settle in until they dry out. 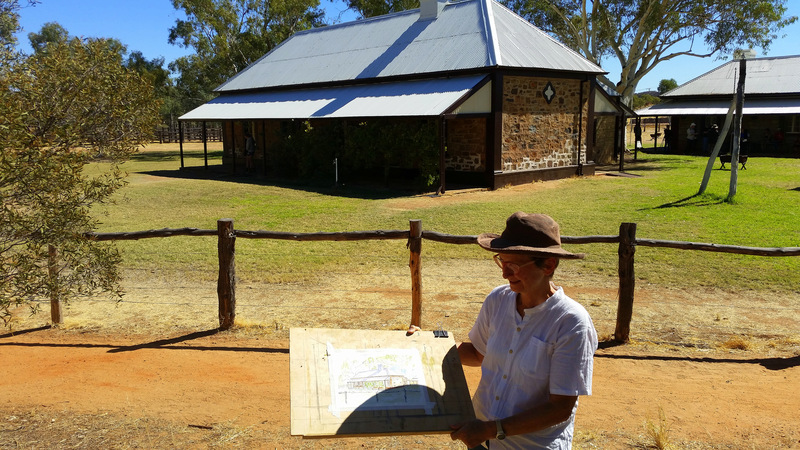 Alison sets up to sketch the ruined Royal Hotel/ Inland Mission building, while I wander the billabong birding. 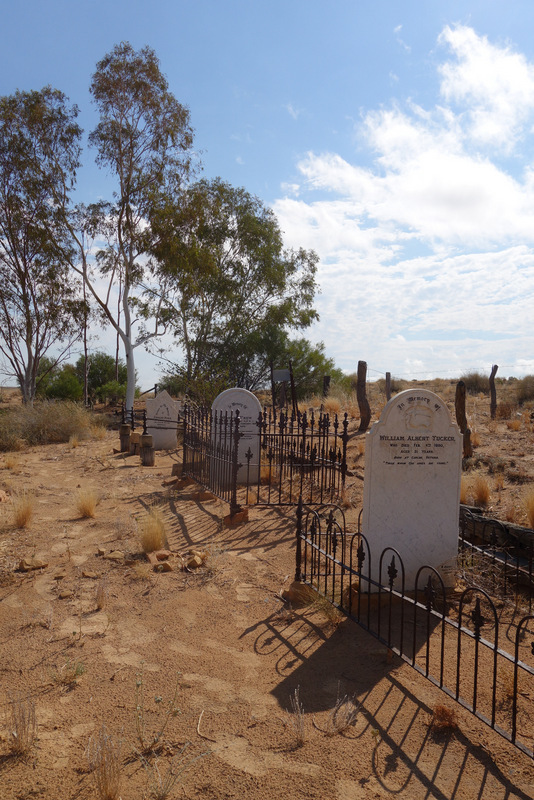 We walk out to the cemetery which used to be on the edge of town, but an airstrip has been placed in the way, so it’s now a 4 km walk around the end of the strip. The road sign is also to the local dump. We’re at a bit of a loss, as we had only planned to get here before heading home again. We have been travelling much faster than we thought we would, and the caretaker/babysitter is happy and comfortable with the dogs and doesn’t want to see us for another 10 days or so. 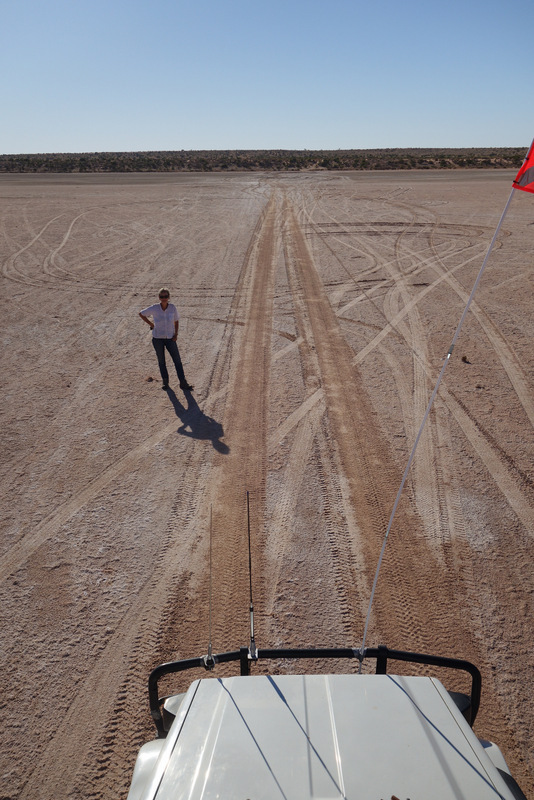 We decide to head south down the Birdsville track to Maree and then go back north, circumnavigating the Simpson and visiting Lake Eyre on the way back to Alice Springs. 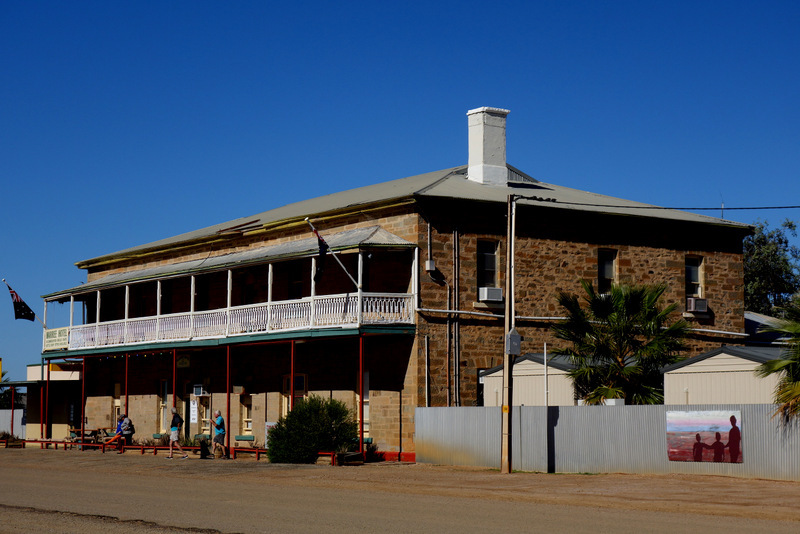 Day 14 to Mungarannie Pub. The roads are opened and we’re off down the track. It’s a good road with us travelling at 90 kph for the first 50 km. 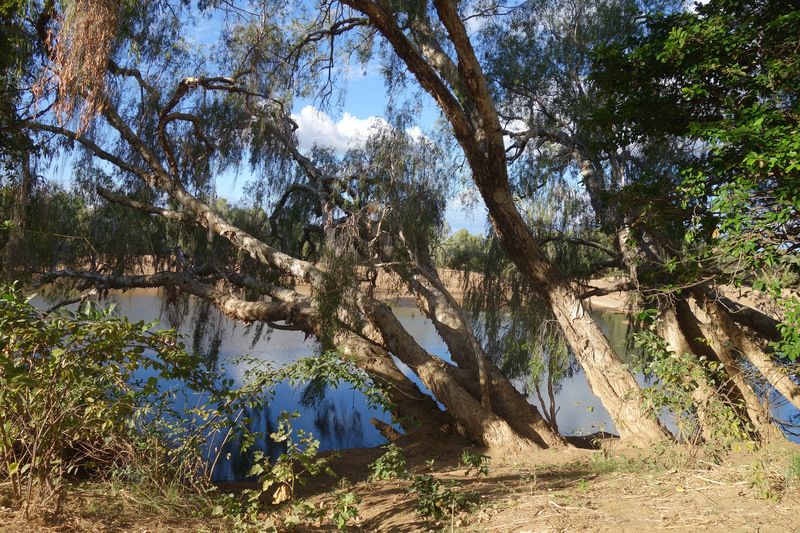 Then the flood plain of the Diamantina river is around us and the road is surrounded by lakes of water. A semi trailer has slid off the road into the gutter and another truck is there pulling him out. 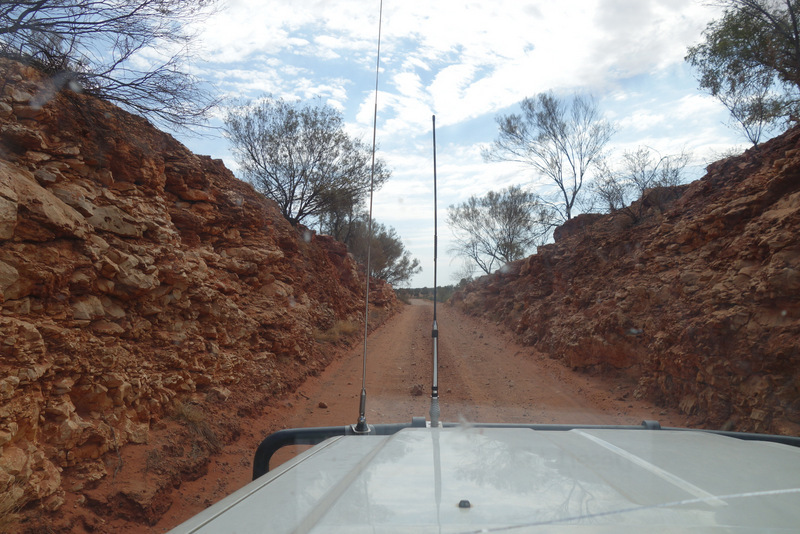 We’re in 4wd, and concentrating to stay in a straight line, and cannot go over 30 kph. Wet gutters across the road send up sprays of mud over our roof, covering the front with several cms of red mud. This carries on for about 50 km until we leave the flood plain behind and the good road resumes. It should not have been opened for another few days. Several caravans are heading north into the mess as we get out, so we wonder how they go. 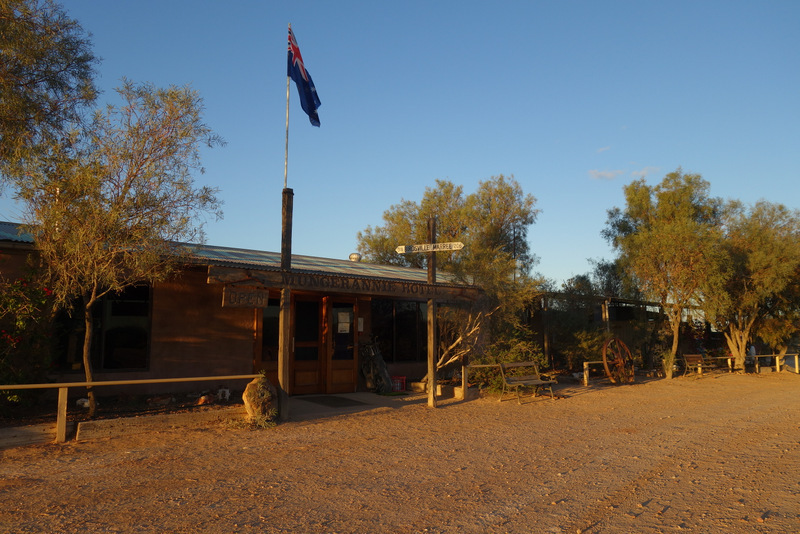 Camp and dinner at the Mungerannie pub, again by a spring but fouled by cattle. 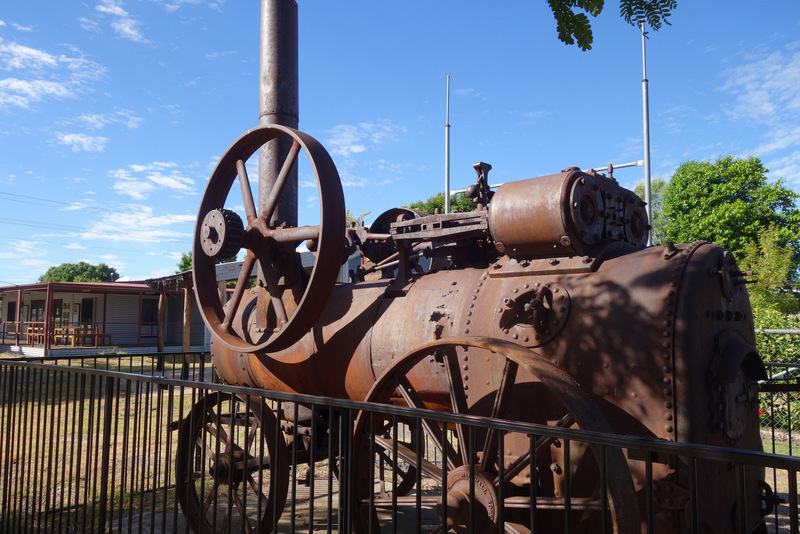 We pass a boiling bore at Mirra Mitta, which the pub tells us has just been opened last night. 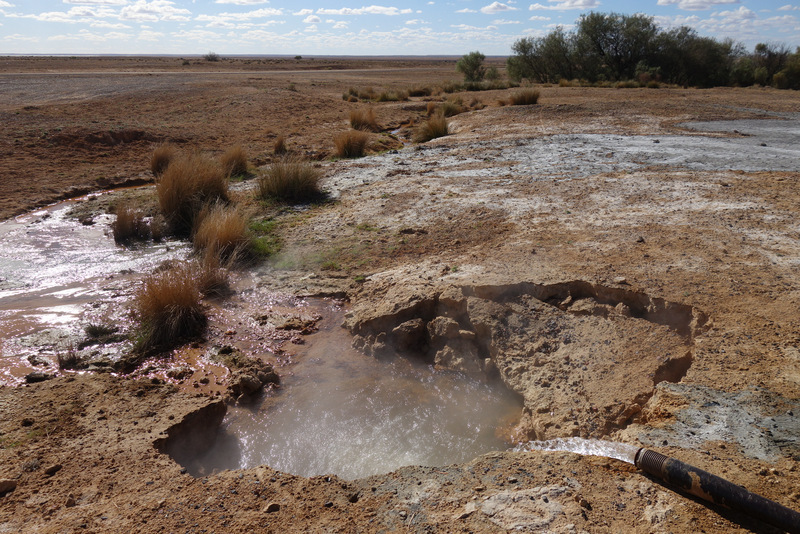 Cattle are drinking several hundred meters downstream of the bore, but it’s too hot to touch where it emerges. Day 15 to Coward Springs. 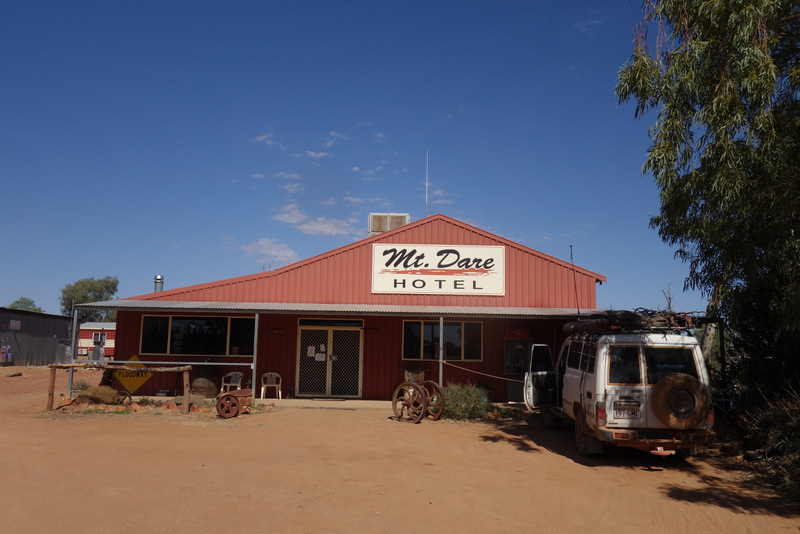 Down the track to Maree and its beautiful stone 2 story pub, apart from which the town is now almost a ghost town after being bypassed by the new Ghan railway. 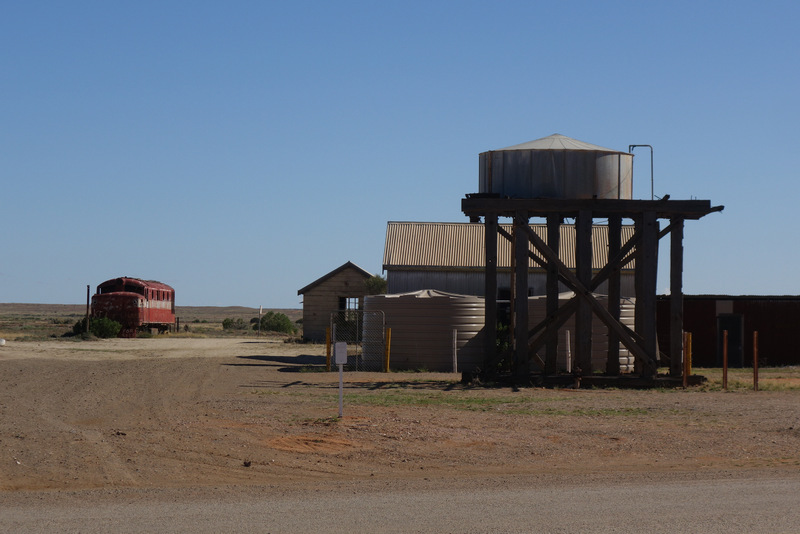 The old station and train now museum, with camel trucks of the previous generation as well. 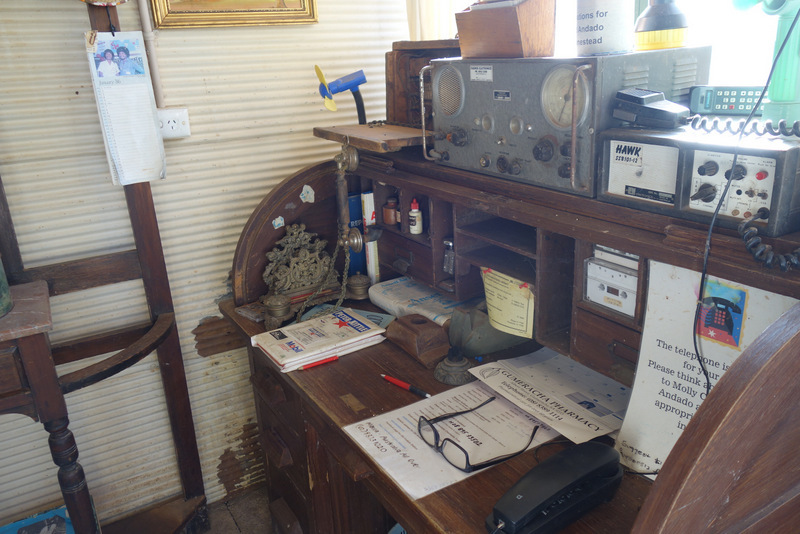 We travelled on the old Ghan back in the 70’s, so it feels strange for our activity to be a part of museum history. 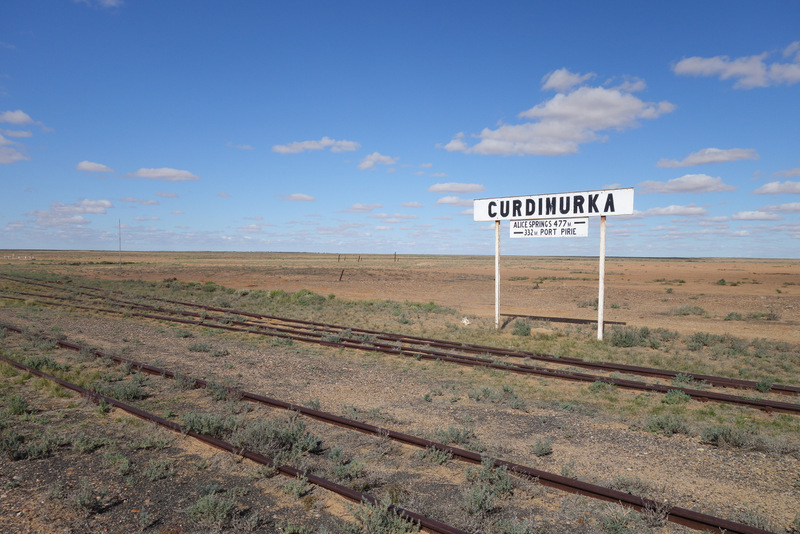 We carry on north up the track towards Oodnadatta, with virtually no traffic, as the main road runs parallel about 150 km west of us. 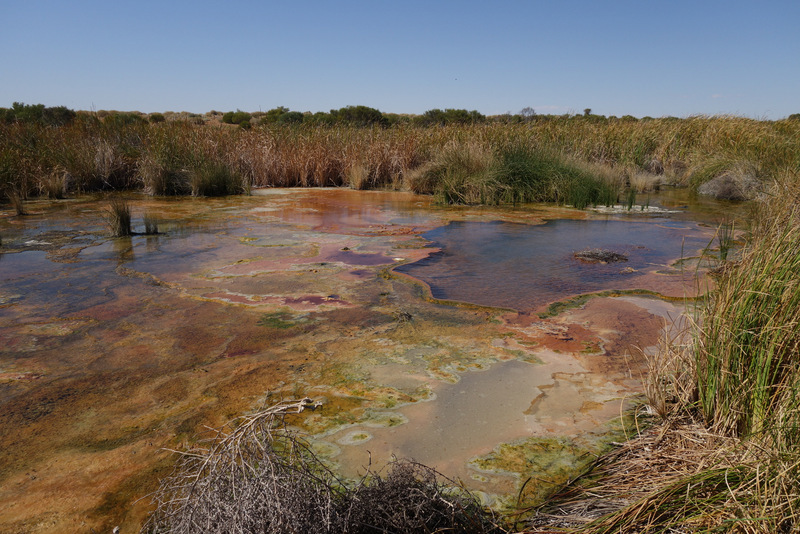 Boiling springs, water bubbling up through the sediment. Mounded well above the surrounding countryside. 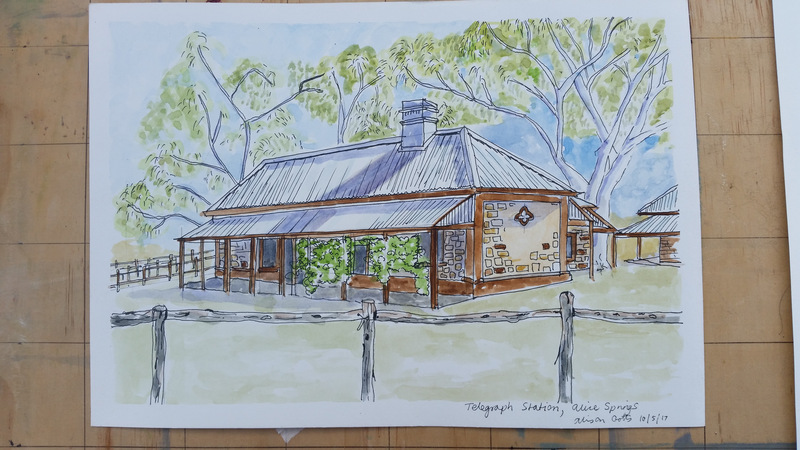 Coward Springs is an old railway siding, now renovated as a campground, date orchard, hot water spa and camel safari business. 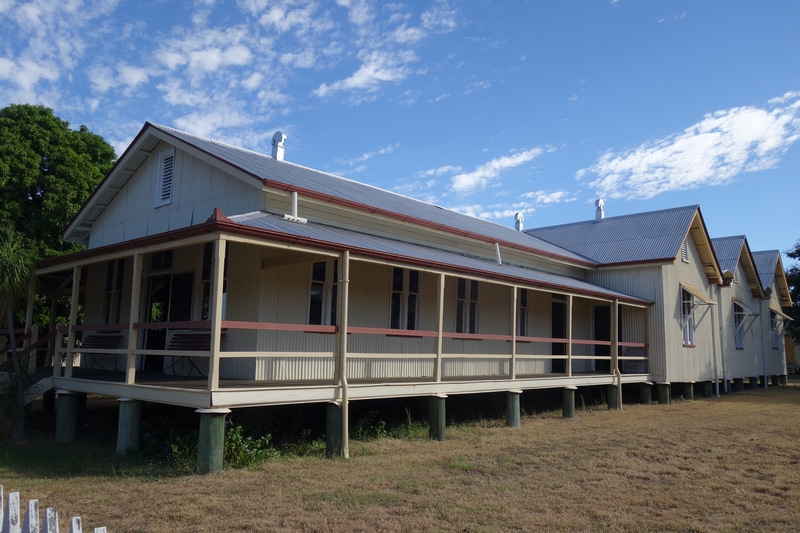 It’s for sale so we’re tempted to make an offer, as it is so like our Cape Trib farm, but in a completely new way. It stays as a dream for now. Day 16 to Peake River camp. 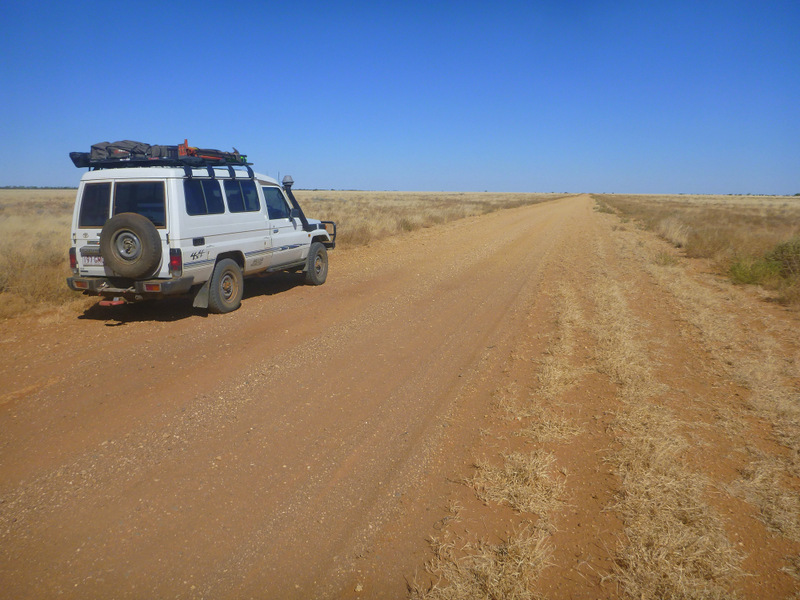 On north up the track to a turn off to Halligan Bay on Lake Eyre where there is a NP campground. It’s 70 km out to the lake, so we think about staying the night after a short day, but the wind is cutting and there is no shelter. 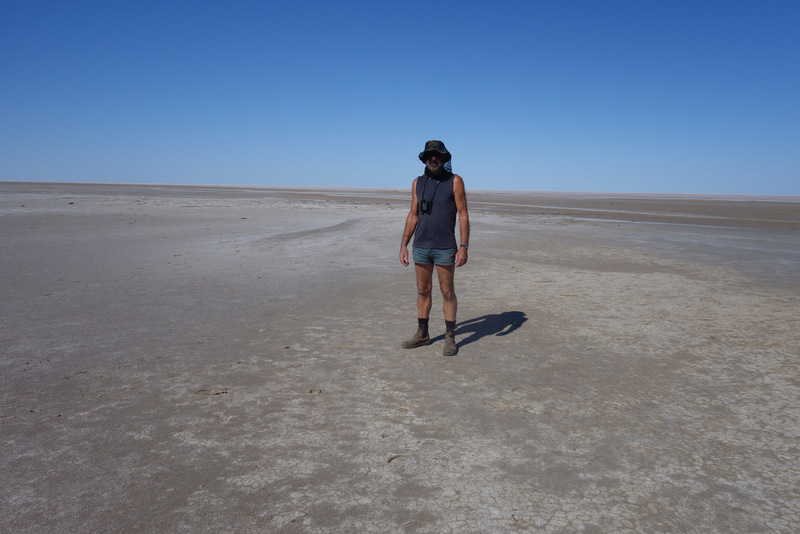 This has to be the most desolate spot in Australia, with the salt lake soft and muddy with supersaturated water flowing into the footsteps as we walk out into it. 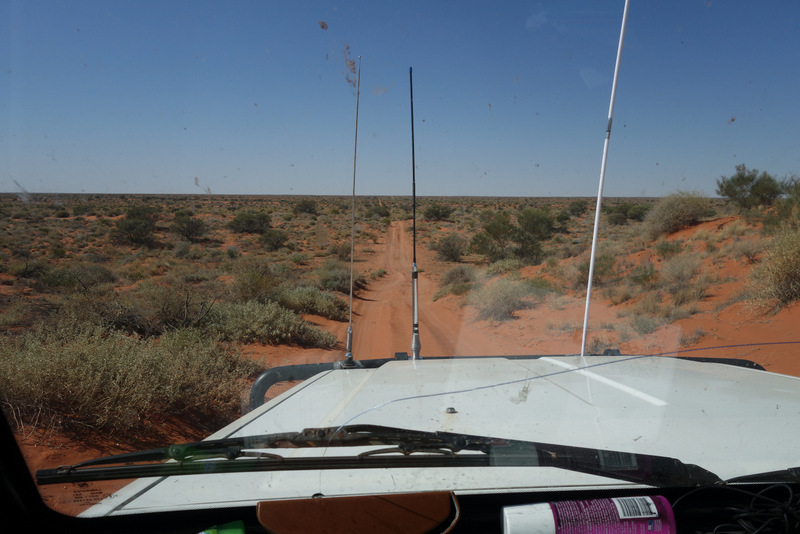 We head back on out to the main track and start north again but a tyre goes down on the corrugations and the sidewalls are badly damaged before I can stop. The spare goes on ok, but the damaged tyre could still be used if I have to. 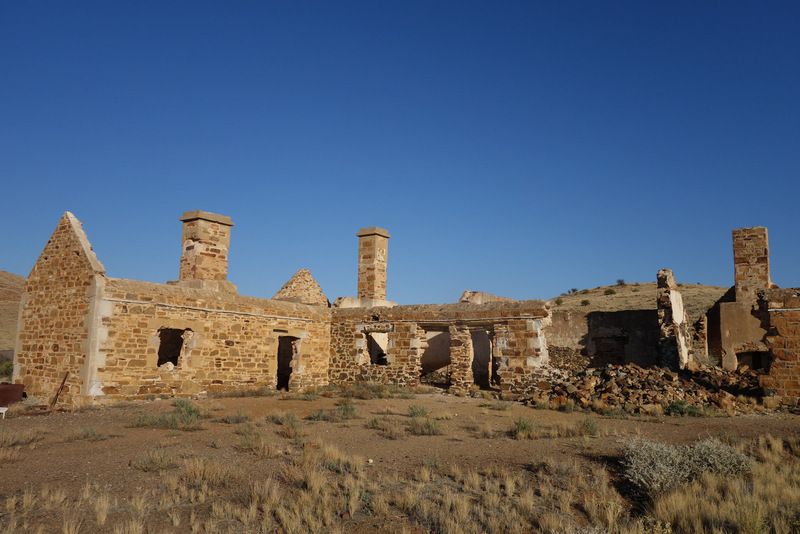 We were intending to camp at the Peake Telegraph station ruins but while the turnoff is signposted, the rules have changed and camping is no longer permitted. 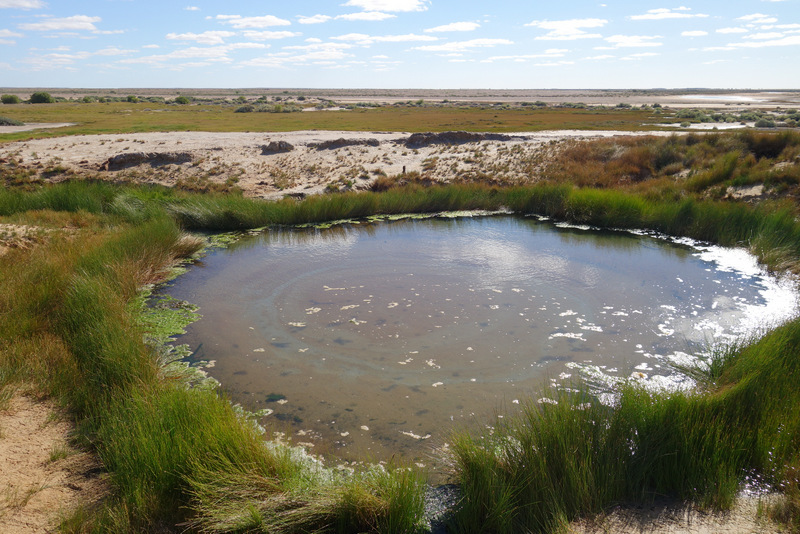 Another site is 12 km up the track, so we head for it to find a lovely spot a few hundred m off the road alongside a salt water course. Dozens of kites circling in a gyre a km or so away all come in to settle for the night on dead trees nearby. Day 17 to Dalhousie Springs. No traffic overnight. 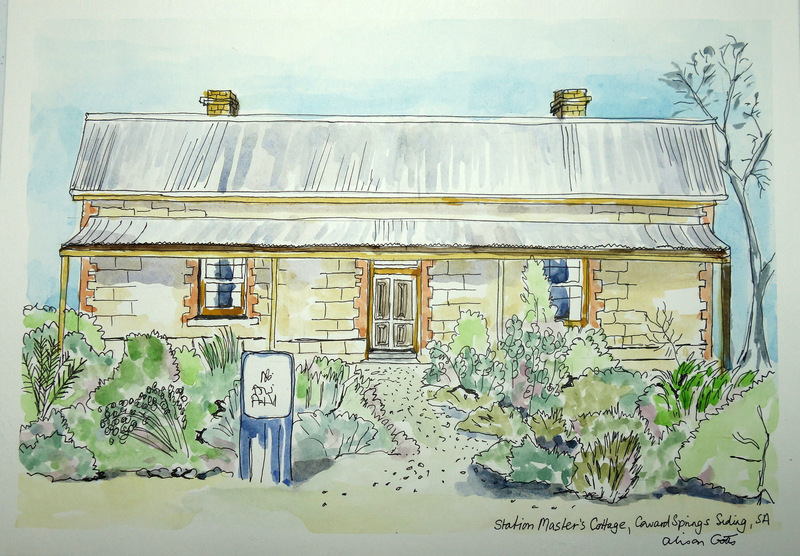 We return to Peake turnoff and drive in 15 km to the ruins where Alison settles down for some more sketching. 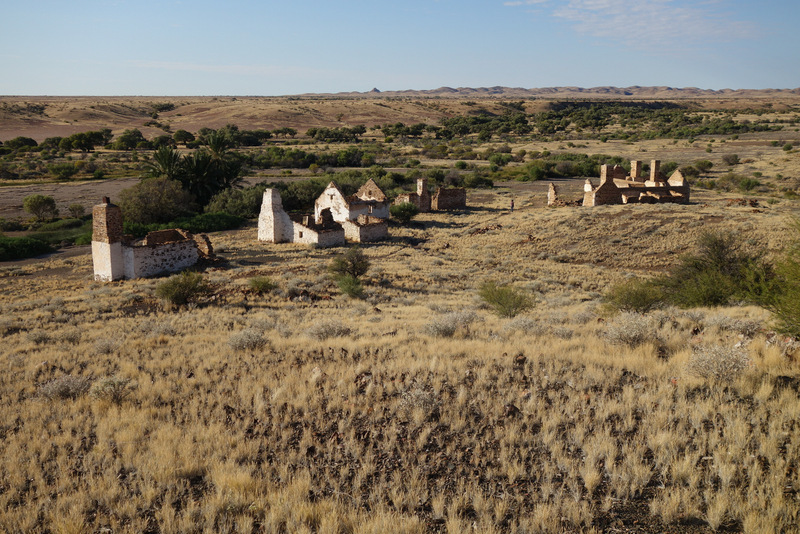 This is effectively a ruined town, with many roofless stone buildings across the landscape. The area was also mined, and the main shaft is up on the hillside above us, but we leave it for now. I strip and change the tyre ruined yesterday so we have a spare again if needed. 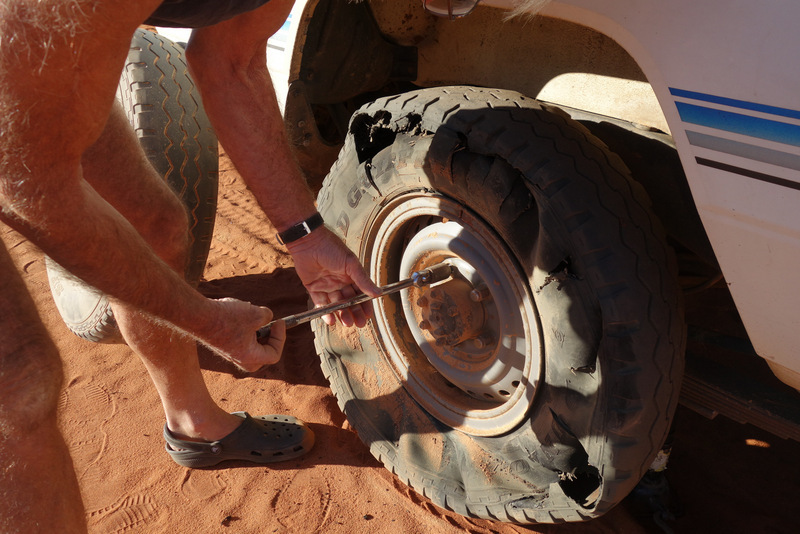 New tyres are becoming a necessity once we get back to Alice. Once the longest railway bridge in SA. 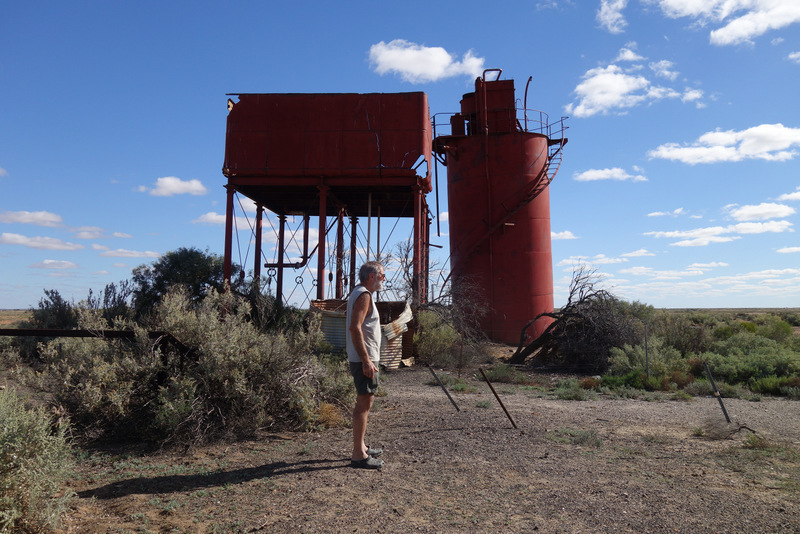 On up the Oodnadatta and the Pink Roadhouse for lunch with cider and hamburgers. They have a tube I can buy, so we have a second spare again if needed. We’ve still several hundred rough kms before Alice, so having the second spare is a comfort. 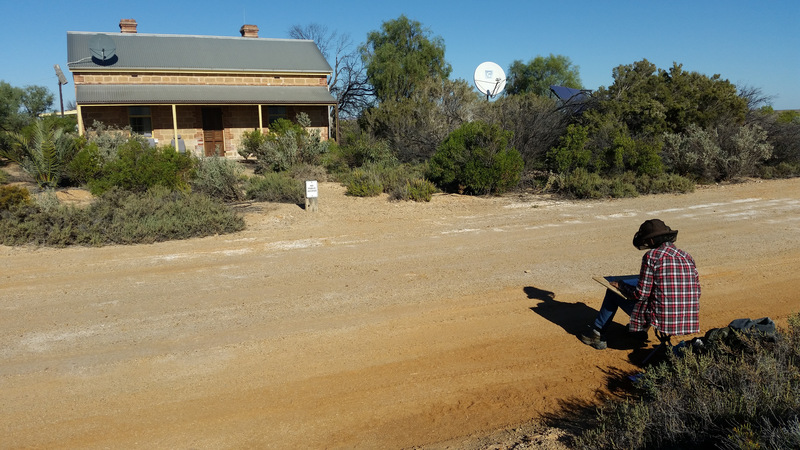 We turn off the track onto another minor track which lets us cut across to Dalhousie Springs via the abandoned homestead and the Perdirka Desert. This is marked as a rough 4wd route, but while rocky in places and needing care on some washouts, it’s not the drama we were led to expect. 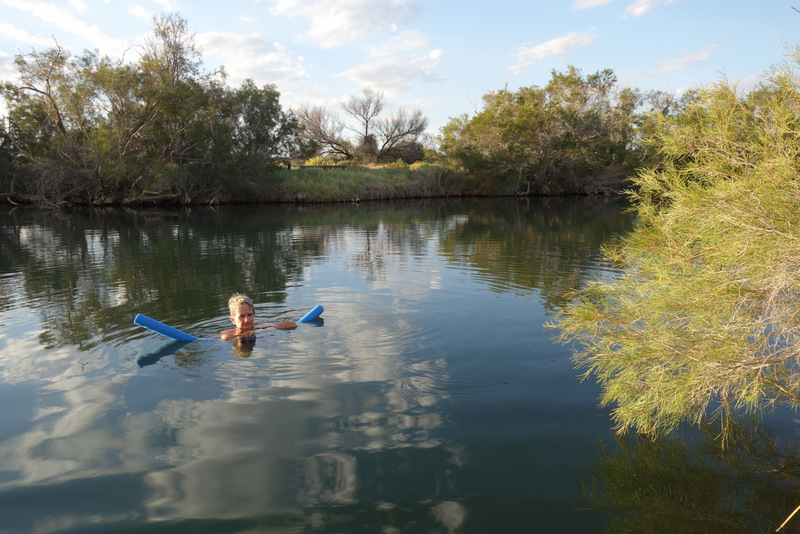 Good to close the circle around the Simpson by returning to Dalhousie Springs and another hot swim, this time with another 8 grey nomads as the season is approaching. 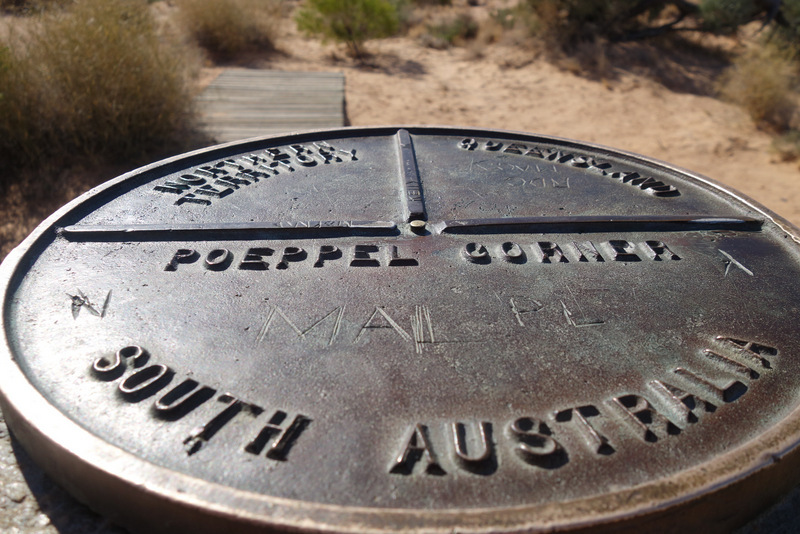 Day 18 and 19 to Alice Springs. 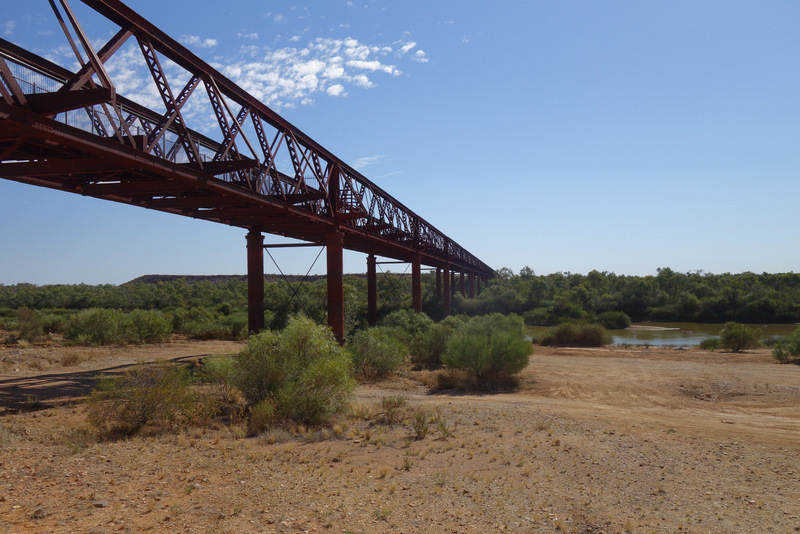 We retrace our route through Finke and up the old Ghan track. Another back tyre starts to go down, but I feel it go on the soft sand and stop intending to pump it back up. On a second glance, its actually shedding lumps of rubber off the tread, and cannot last much longer. It is the original spare that’s been on the back of the car for at least 10 years, so another one bites the dust. 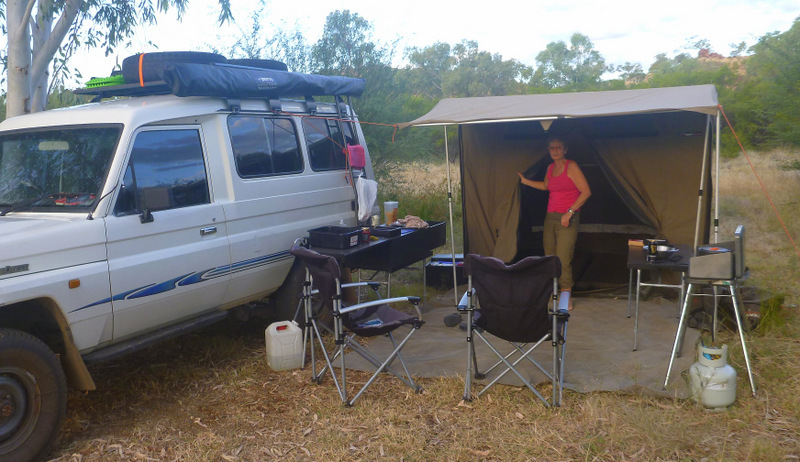 We make it through to Alice and set up in a campground in an outer suburb, much quieter and cheaper than any near town. Alice Tyre Power queue jumps us and fits three new tyres, while we wander the mall and have a coffee. Back to the caravan park to read and bird watch for the afternoon. 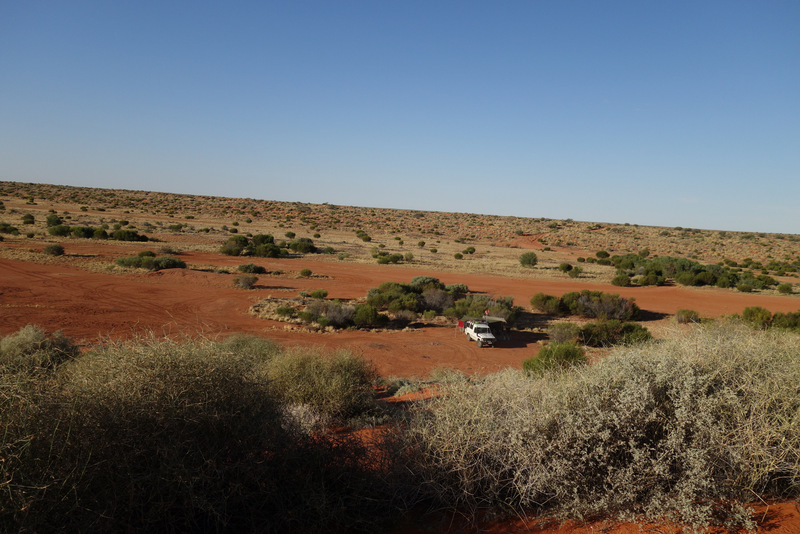 Day 20 to Sandover Hwy camp near Alpurrurrulum. Back on the main road north for about 70km to our turnoff onto the Sandover Hwy, which is mostly a well formed if sandy track where we’re able to sit on 80-90 comfortably. 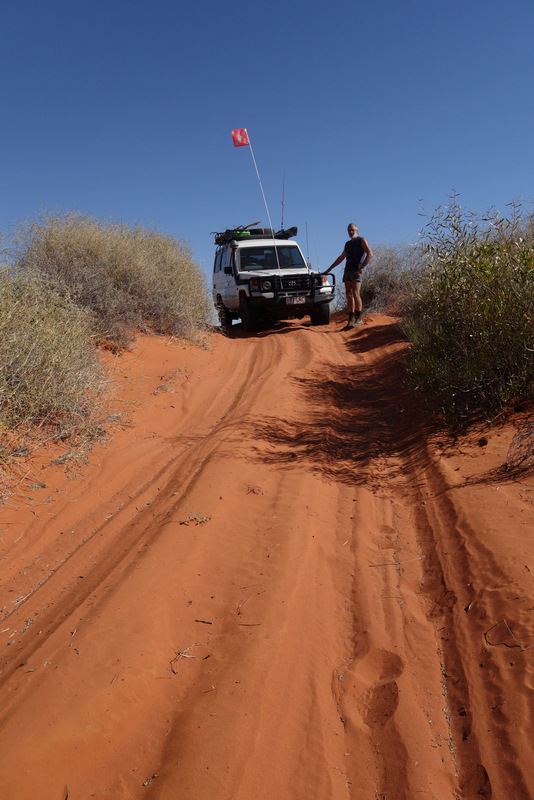 There were a few patches of deep sand that we had to slow down for but generally a good road. 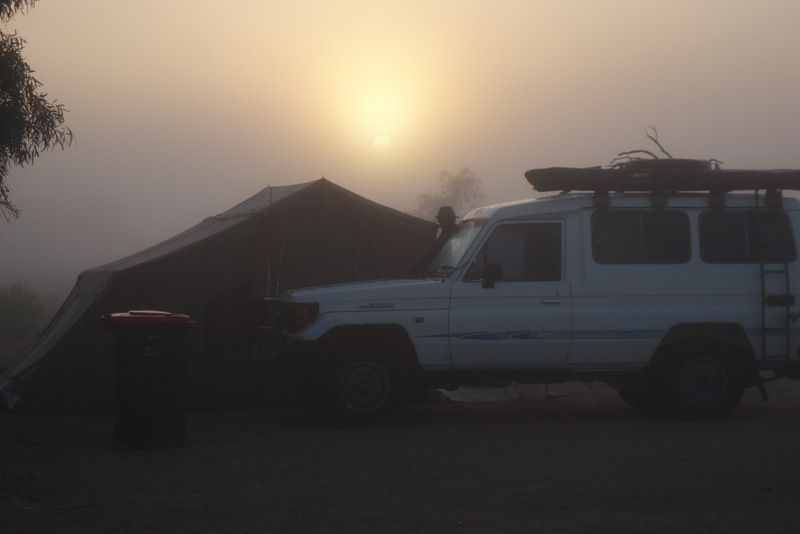 We were doing at least 85 kph when a police car appeared out of our dust cloud and shot past, obviously in a hurry to get somewhere, probably off to a station as he went past again, but at a much more sedate pace, as we were setting up camp. We seemed to have picked up some poor fuel, as we are now speed limited to 80 kph, and the engine won’t rev beyond 2400rpm. Day 21 to Richmond Caravan Park. We just wave at Alpurrurrulum as we go past. 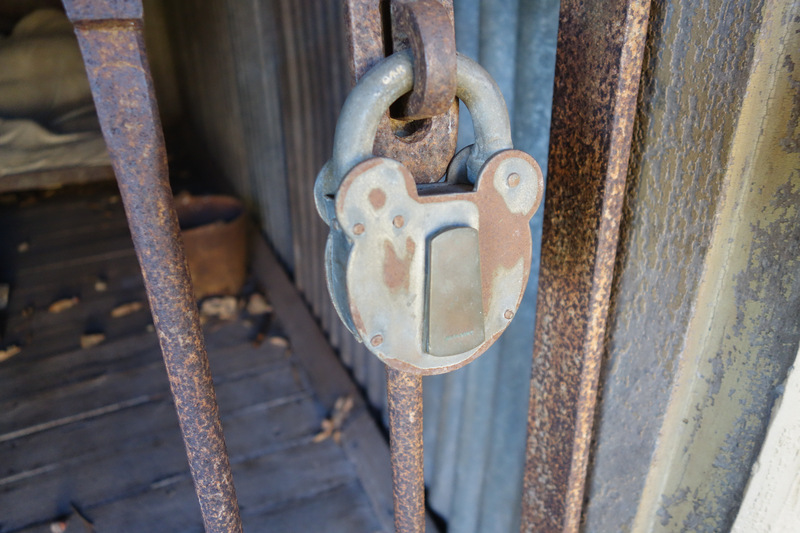 We spent 3 months teaching there, and feel no desire to go in and say hello. 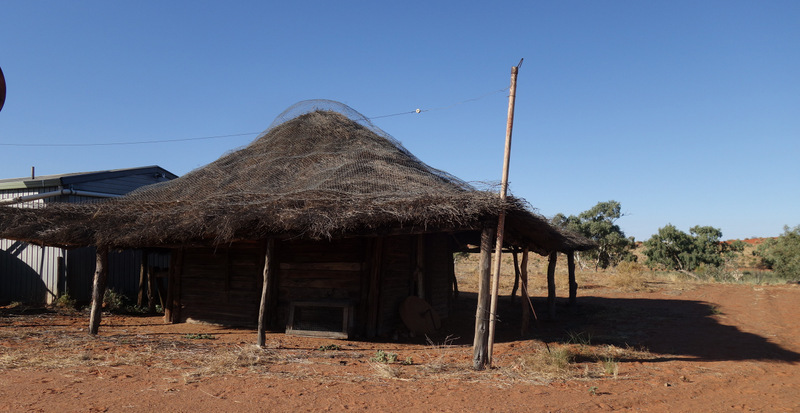 This is where “We are staying” was enacted, and the book written as a result of the court cases forcing the Lake Nash property owners to look after their community and stop trying to force them off their land. I had to read the book out loud into a tape recorder so the older men could sit around and listen to it at their own pace. 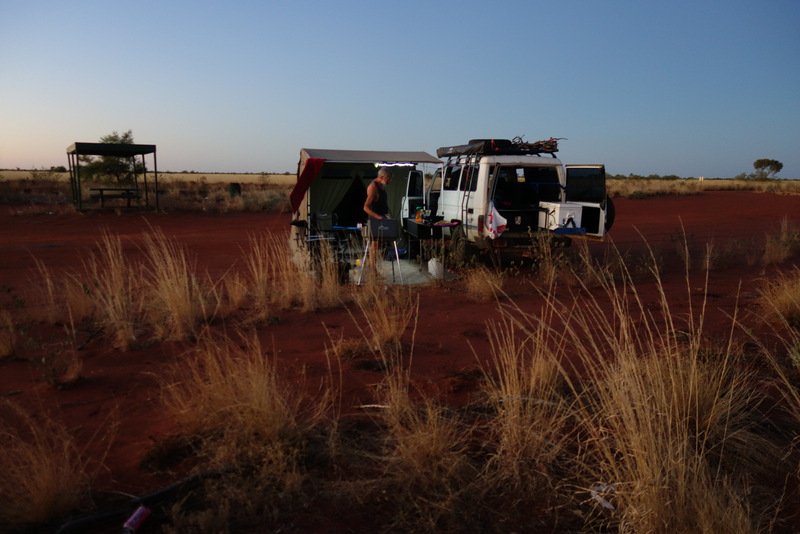 We get through to the main highway about 30 km from Mt Isa and I stop to strip and clean a fuel filter. Helps a little, letting us get up to 90 for the run into the Isa. We find a Repco store and buy the two filters that seem to be required. The caravan Park at Richmond is one where we have stayed before on a wide green lawn overlooking a pond. Empty last November, but now there are 4 other campers on our lawn! There is probably room for another 10 so it’s not that bad. 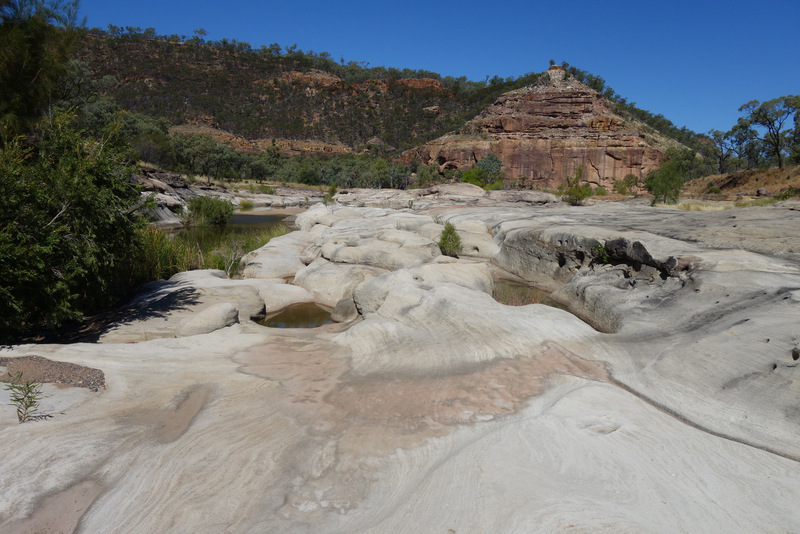 We have promised ourselves a stop at the Porcupine Gorge National Park north of Hughenden ever since we started coming through on this track 30 or so years ago to get to Epenarra from Cape Trib. Haste or dogs had always stopped us so it was great to finally have time to spend going down into the gorge proper. 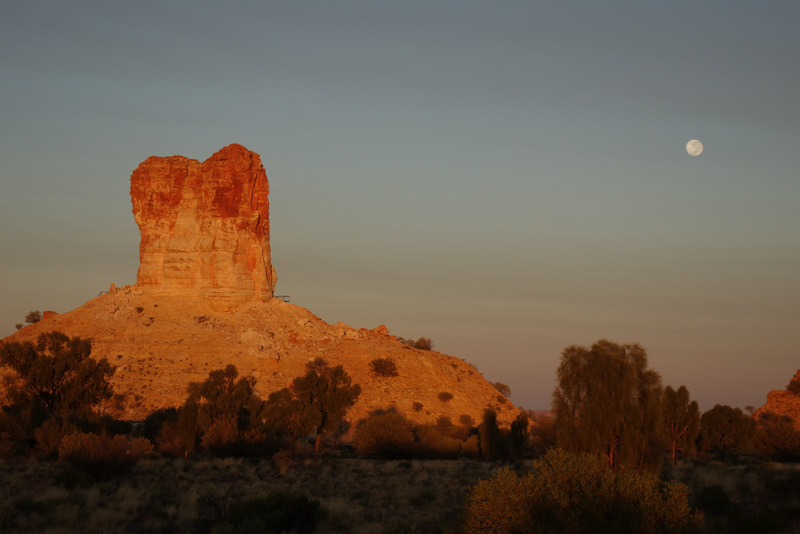 It’s about 11/2 km down 550 steps to a small stream and swimming holes under a looming red/orange cliff called Pyramid Rock. 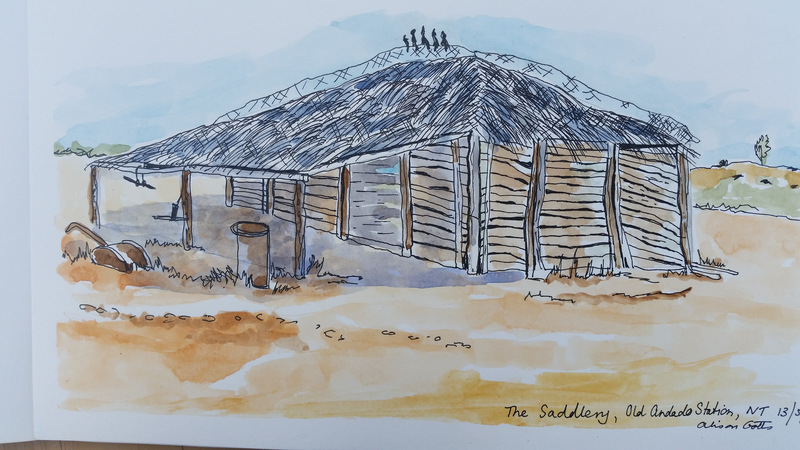 Alison draws while I wander around birding. There are meant to be breeding Red Goshawks here, but they stay hidden for this visit. Lots of other wildlife though, with bettongs wandering through our camp and grazing under the picnic table and a brush tailed rock wallaby taking off at speed when I disturb it in a gully above the cliff. We see possum scratches on trees, then we are woken by one actually on our kitchen bench eating an avocado seed from the garbage bag. 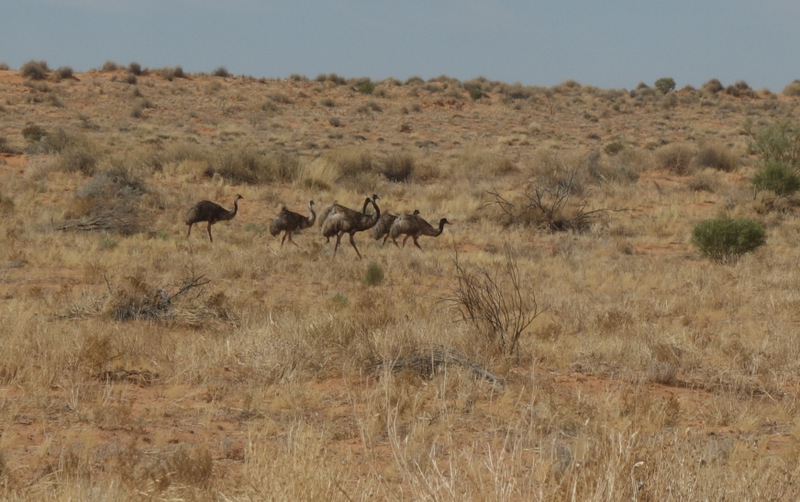 Walk away from the campsite a hundred metres or so, and kangaroos take off in all directions. Just a long drive to stay with Val overnight before heading for home in the morning., but the new fuel filters at least allow us to travel at speed. 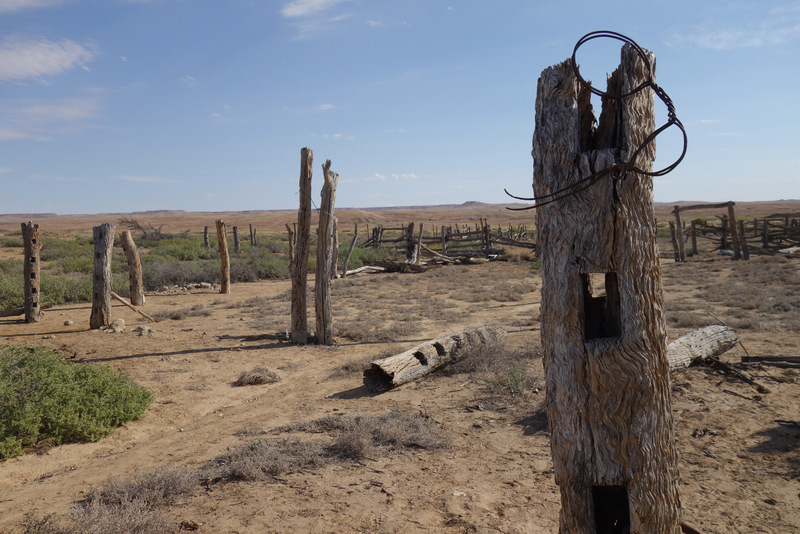 The road through the Lynd is almost sealed right through, with maybe 50 km still to go in patches. 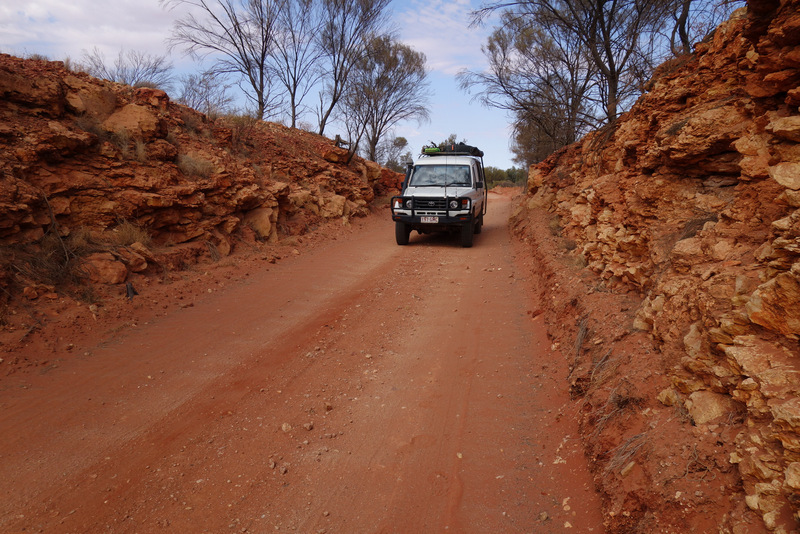 Our first trip down it in about 1988 was almost 4wd in spots, with the bulldust likely to catch on the bull bar.